Published in 1954 the importance of this book, which required a full year's research in Italy, can only be appreciated when you realise that she was working in a post-rationing England which regarded Italian cuisine as nothing more than variations on pasta and veal. What she discovered was an enormous wealth of regional diversity in ingredients, methods, and even language, where the same pasta shape can be called three or four names in different parts of the country. She understood that all Italian cooking is regional; there is no 'national' cuisine and so there are eight recipes for aubergines, fourteen for artichokes, five for fennel and seven for lentils, all from different regions. But if such descriptions seem to today’s reader overly thorough it is because many of her 1950's audience would have never heard of risotto, gorgonzola, prosciutto or even olive oil, let alone been able to purchase them. 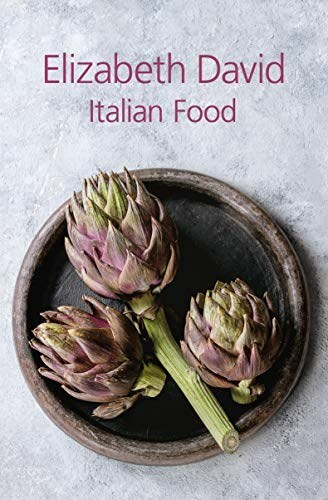 This is a critical and analytical look at Italian food – her personality and point of view come out on almost every page – organised by type of dish rather than by region and is full of details of kitchens and cooking by painters from the 14th, 15th and 18th centuries. The book is filled with asides and quotes from Italian writers and thinkers and as confirmation that this is more a work of scholarship than a simple book on cookery, there are appendices of bibliographies and notes on wine. If you want to explore the authentic regional roots of the Italian kitchen, Elizabeth David's masterpiece is the place to start. And the joy and relevance of this book today is that recipes that could only be read 60 years ago can now be cooked and savoured. Elizabeth David’s acclaimed writings are often cited as an inspiration by many of today’s leading chefs, as well as home cooks, and are essential to any serious cookery book collection.